Time for the annual pilgrimage down to the Storehouse. The wander around the factory is interesting enough-ish first time round but I’ve been here a few times now so, now that you have to queue for the taster, which I’m not arsed with, it’s all about the Gravity bar. Straight to the top for the best view with a pint of Guinness in Dublin, maybe even Ireland, maybe even the world. 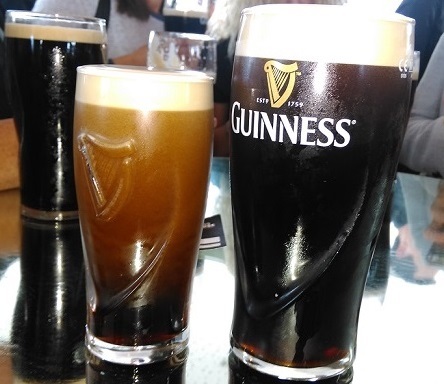 Havin a pint while looking out across the bay & from Meath to the Wicklow mountains is such a wonderful experience but the real question for Guinnesslovers is, of course, what’s the pint like? This place must serve the most pints of Guinness anywhere in the world. There’s always a rake o’good looking settlers at the bar & the staff fly though them, churning out pints like a Guinness machine gun. The head on my first had decent texture but, being honest, was just a little too big. Nothing to be alarmed at though as the taste was true & the head averagely creamy: worth going again, which I did. You might have expected the home of Guinness to be a nailed on 4/4 but the fact is that it’s just another bar serving nice pints. In fairness, you could sit up here all day enjoying pints with that view but when it comes to the honest assessment, this establishments effort gets a 3/4. Yes, that’s mine on the right! Note the manky lookin pint in the background; there’s a rake of them up here from the tourists that realise after 1 sup that they hate the Black Stuff.